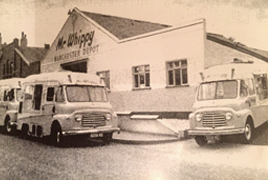 Mr Whippy Soft Ice Cream are the number one choice when it comes to Ice cream Van Hire in Cambridgeshire and the UK. We operate from Cambridgeshire, East Anglia and are able to offer the very best quality ice cream vans to enhance any event or function. We hold 5 million pounds public liability insurance for your safety as well as all staff having Level 2 health and hygiene certificates. We are registered with the local authority and currently hold a 5*star hygiene rating. Full risk assessment as well as other necessary documents are available and our staff are also allergy aware. Mr Whippy Soft Ice Cream is a family run business, We can supply single or multiple ice cream vans for any size event, We have built a proud tradition of delivering the best quality ice cream products to our customers at a wide range of events including sports, music, family, agricultural, corporate and various others. We source our high quality ice cream from the very best dairies from around the country who have a reputation for quality that is unsurpassed in the industry. 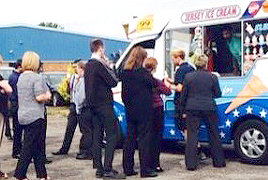 We provide Ice cream van hire for all occasions including weddings, music concerts, events, birthday parties, corporate events, team building days, promotional work, sporting events, school fairs as well as many more. 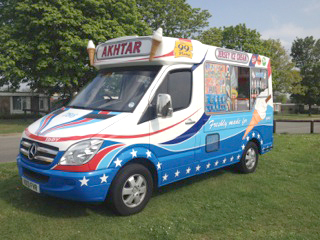 Ice cream van hire has become increasingly popular throughout England in recent years as it known to create a sense of nostalgia among your guests and can add a bit of fun to any occasion!